301 in stock Need More ? Fundamental mathematical skills are at the heart of 11 plus and common entrance exams. Mathematical questions at 11 plus are typically a combination of worded problems, requiring comprehension and mathematical manipulation of data, and quick-fire numerical questions, testing a child s raw mathematical ability. This collection of tests is designed to expose a child to both types of question. 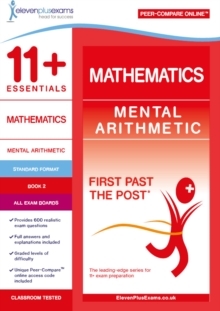 The questions provided within this book are intended to develop the fundamental building blocks of mathematics to equip a child with the skills required to sit the numerical reasoning sections of the 11 plus and common entrance exams. The suggested time for each paper is based on data obtained from conventional classroom testing sessions. Students requiring publications that address the numerical reasoning sections of 11 plus will also benefit from the 11+ Essentials Numerical Reasoning Multi-part Book 1 and Book 2, and Numerical Reasoning Quick-fire Book 1 and 2. These books contain practice papers that are representative of the exams set by both independent and public schools and are best used as real exam practice. Extensively road-tested by Eleven Plus Exams, all 11+ Essentials tests are best used to benchmark a child's performance. The online service helps to identify areas for improvement and, crucially, to gauge relative progress. They are perfect for use both in the classroom and at home.